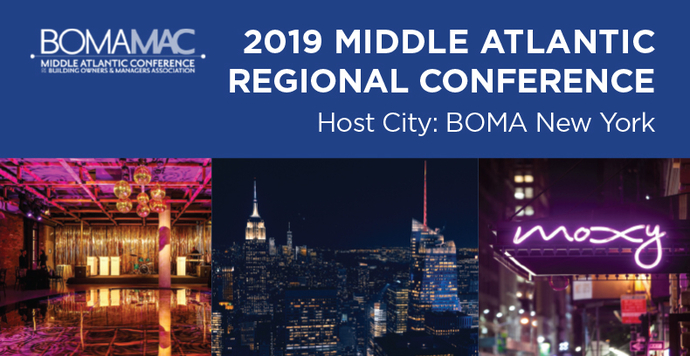 BOMA New York is excited to be the host city for the 2019 Middle Atlantic Conference TOBY Dinner and MAC Board Meeting! This abbreviated MAC Conference celebrates the Regional TOBY Award Winners held at Kimpton Hotel Eventi - Ventana Ballroom overlooking Avenue of the Americas on April 4, 2019. Open-Bar Reception: 6:00 p.m.; Dinner & Awards 7:00 p.m. - 10:00 p.m. Ticket Price: $350 per person; tables are available at the per person rate. Hotel Accommodations: MOXY Times Square, 485 Seventh Avenue (on 36th Street, off 7th Avenue). Group Name: BOMA MAC 2019; If you wish to reserve a room for arrival prior to April 4th and/or departure after April 5th, please call the hotel directly at (212) 967-6699. The above room rates will be honored, based on availability. You MUST complete the registration process in order to be considered a registered attendee. Once you have registered, you will receive a confirmation e-mail. If you do not receive one, you have not completed the registration process correctly!! !